Resoborg, is a well-established Durban-based artist, illustrator, graphic designer and muralist, working for clients across the globe. 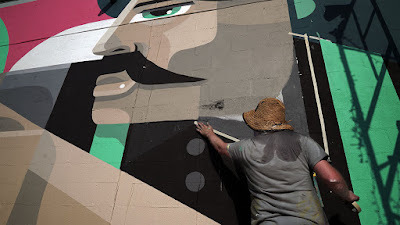 Resoborg has been in the art and commercial design scene for over 10 years and has made a name for himself locally as well as globally, with his large-scale murals and art pieces. His work is instantly recognisable with bright colours, clean lines and subtle messages of hope and upliftment for the community. Resoborg also focuses on commercial graphic design and illustration, having done work for a variety of clients in various sectors of the creative industry both in South Africa and abroad. Resoborg was recently commissioned to paint a mural in Strasburg, Virginia in the USA, through an artist programme called Staufferstadt Arts, a local initiative in Strasburg, aiming to uplift its community, revitalise the town and inspire and challenge the local youth, along with creating a unique experience for artists to create work outside the confines of urban areas. Staufferstadt Arts is a non-profit project formed by a handful of passionate individuals, with the goal of creating a gallery of world-class mural and street art against the unlikely backdrop of smalltown America. The project is equally about presenting contemporary work in a unique setting as well as creating a potential roadmap for reimagining rural America through the act of building creative communities. The project selects and invites artists from around the world to come to Strasburg to create large-scale public art. Staufferstadt Arts prides itself on providing a uniquely supportive environment where their work is truly impactful. In our current fractured and uncertain climate, Staufferstadt Arts creates work that promotes dialogue, builds bridges and highlights the universal ties that build communities both small and large. The town of Strasburg is nestled in the countryside of Virginia, near the Shenandoah National Park, just 75 miles west of Washington DC. Resoborg's mural, named Sonner’s Sonnet, is a depiction of one of the potters that used to live in the town in the 1800's which at one stage was known as "Pot Town" because of the large cottage ceramics industry. Antique stores are plentiful in this town where pots from this era can easily be found. As glassware replaced this industry, potters as a last resort began to offer unglazed pots for the buyer to customize. Often pale in colour in comparison to the darker shades of dirty green and red, these unglazed pots were an inspiration for the mural which is an abstracted portrait of John Henry Sonner, a local potter. The unglazed pot in his hands acts as a metaphor for the town and its potential as a canvas yet to be customized. It is also a celebration of localism and the independent craftsman; celebrating the power of individuals to shape their own future. Coming from South Africa and facing challenges such as crime and high unemployment, Resoborg experienced the town as close knit, friendly and relatively safe - an almost utopian existence from an outsider's perspective. Like any town, however, it faces its own challenges with many youth leaving the town for bigger cities in search of work opportunities. Resoborg’s hope is that the mural inspires the youth and the local community to dream big and shape the town as a potter would with his art. The pot also features the "Seven Bends" which is the famous Shenandoah river that runs through the town and surrounding area. The uniquely-shaped river, which curves seven times, was sculpted by a series of geological processes spanning hundreds of millions of years. This shape on the pot in the mural represents determinism and patience for locals to hold true in overcoming adversity and creating an impactful existence in their town and community.